If you want to hang out.. come on over to Facebook and make me your friend, join my group, and meet LOADS of great quilters! If you are not in Facebook I highly recommend it.. and believe me I sometimes felt I was the last person to have tried it.. hehe!! It's more interactive than email and a group list, and I'm really having fun with it! Go to http://www.facebook.com and join. Once there search on Pat Sloan and send me a friend invite. I'll approve it and send you a message to my group Pat Sloan's Place! Simple! PS - Be Sure you read ALL THE WAY to the end of my newsletter this time!! Extra Kits just for you! I have a few kits for my NEW pattern Caribbean Sunrise, which is the project we did on the cruise this January ... and the single pattern too! $39.50 for this 48" x 48" quilt kit.. pattern way less... hehe! And an extra kit from the China Trip. There is plenty of fabric to do you own thing, a pieced 26" x 20" background, a bonus needlecase to applique, and enough Hexagon papers ... a very good deal! This is a 70" x 70" quilt. I am CUTTING kits as we speak for 'A Secret Garden' and FQ bundles of Arabella... let's all say a big WOOT!! If you are interested in a kit email me at pat@patsloan.com and I'll put you on the list. I am doing my first set of pre-orders now and I'll do a second set as soon as I order a bit more fabric! So email me a pre-order and I'll keep you updated on when it will be ready. Please note that Shipping is extra as it will depend on the size and weight of your actual order. To PRE-ORDER send an email to me at Pat@PatSloan.com Put PRE-ORDER in the subject. In the email tell me if you are pre-ordering a FQ bundle, a Kit, or both. When your FQ bundles and/or kit is ready for you I will send you an email with a link to the purchase page.... it's that easy! I will also have a SeW AloNG! for the 'A Secret Garden' quilt... won't that be fun! And yes... the pattern is available by itself.. at the webstore now! Let's do Lunch...Dinner AND Breakfast! My trips are fun... and I'd LOVE to have more of you hang out with me!! I have a little incentive for guilds to share my trips with your members.. or maybe even to organize you very OWN trips! How fun will THAT be???). Email me at pat@patsloan.com to get the guild incentive info! Sew Many Places also has a payment plan for your trips. When you call the office ask them to work with you to develop a payment schedule that fits your budget.. pretty nice eh? I'm hoping for a few more of you join me in Alaska in May! Have you wanted to go to Alaska? Take my trip where you'll meet other quilters AND enjoy the vast beauty of Alaska! My Alaska trip is May May 23 - 30 2009. So where ELSE will I be?? Check my workshop page at the website! PS - I'm working on my 2010 events too... can't wait to share! A Virtual Retreat.. come SeW AloNG... and do The OP! My next virtual retreat is Feb 20-22 and it has a theme. A color theme! I selected Orange as our 'color' of the retreat and it's going to be so fun to play! From now until then, I'll have a few tips and 'to dos' for you to be ready. We'll be using orange in combination with 2 other colors (or more if you are adventurous!) to explore how orange looks with different colors. To explore balance of color. To explore using orange if you never have!!! I will be giving you an easy block in 2 sizes ... so you can work the way that you like. There is no supply list.. but over the next few weeks you'll start to get a feel for your fabric and what you may want to add. Don't have orange... OI VEY!!! Correct that! Beg, Borrow, or Steal... um BUY some soon so you can play! The posts about the Virtual Retreat will all be on my blog. If you want a button for your blog here it is! Link the button to the SeW AloNG! category... that is also where you need to go NOW to read the first post... next post on Tues or Wed! I'm so pleased that my next Celebrity Interviews will be with the design team of Laurie Simpson and Polly Minick!!! Watch my blog as I'll announce the February interview dates. This month Betty's Pick is author Patricia Cornwell. She is an author with exciting and interesting stories. And join the Yahoo Good Book Cafe group too! We have a lot of fun sharing authors and books titles. We don't critic the books, but people will give their opinion on a book if you want to ask about one! Resident Chef Cindy gave us this month's dish "Sausage Chowder". Thanks Cindy!! Ada Lee also sent me a fast dessert that sounds really yummy! And I joined the biggest yarn community around... Ravelry - add me as your friend ... I'm Pattycakes! There is an nice group of quilter's who knit and LOADS MORE! Our next block is the top right bird in the bird bath. You could make this as a single wall hanging and it will be adorable... and of course put it in your main quilt too! FINISH the monthly block AND SEND me a photo or a link to your photo... you will be in the running for a little prize... woot woot! --NEW NEW NEW Block of Month with Emilie Richards.. yes AUTHOR Emilie R and I have teamed up to bring you a BOM based on her 'Sisters Choice' book. Check out Emilie's site TOO! -I have my 'Remember it's 5 o'clock Somewhere' quilt top DONE.. well almost done as I have to stitch the words... but done enough to show you! It's loaded to the page. -And next month I'm going to give you a FREE alphabet to use! Two sizes of letters... it will be on the free pattern page as well.. something to look forward to! -AND if this is not ENOUGH fun... Rachel has started a blog for people who want to do my Calendar Quilt project during 2009... woot! 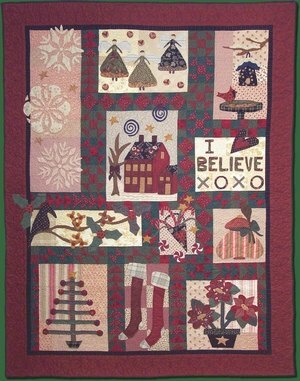 I hosted this a few years ago and then put it in my Techniques book.. along with several quilts YOU made! Maybe you have wanted to do this, maybe you want to finish one you started, maybe you are just learning about it. .. come one, come all and join Rachel at the Calendar Quilt Challenge blog! And guess what, I'm going to hang out too, I'll post at least once a month... cheer you on and answer any questions you have. And you don't HAVE to start with January... just start the day you start... catch up the missing days during the year. Oh .. hi! I see you made it all the way to the end of my newsletter.... good for you as this seems like such a LONG one this time!! The last few weeks I've been exploring the internet community of Facebook and really loving every second! I am meeting new quilters, quilters who have taken workshops with me, getting to know people better that I've meet, and chatting with quilters who have followed my work. This has been SO exciting! This infuse of communication had me chatting with lots of people and one person mentioned that I took to Facebook so quickly. And that made start to think about what I've been doing all these years on the internet. How I started with cap-access in about 1995 (yes... really... 1995!!!) where our quilt group had a community. There were only so many allowed on at once and I'd get SO IMPATIENT for my turn!! I'd keep signing in and signing in until someone had either logged off or got disconnected... here is waving to Barb who started that group!!! In 1998 I was in some delphi communities, then in 1999 I built my first website. At some point I discovered yahoo groups and started my own... which I still have going strong! I created MORE yahoo groups and about 2 years ago I built my blog. I have also cruised many forums, other yahoo groups, and last year hooked into Ravelry (which is all about yarn). With all these places I realized I didn't have a way to tell you where I am, so I'll be creating a page at my website with my internet locations.. stay tuned!